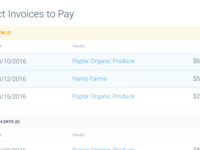 Mid-size to Enterprise companies in the food industry that process at least 100 payments per month and are using Quickbooks, NetSuite, Microsoft Dynamics GP, Intacct, or Sage. TrackMySubs was designed for entrepreneurs. Those working in startups and businesses who are leveraging the unlimited services and apps available online to help manage and grow their business.